Plants give your homes and workplace a healthy, fresh appeal. It is the plants that gives us pleasure and relaxation, and provides us with fresh air. Plants in your workplace and home keep your ambient indoor climate cleaner and more stable. Plants improve the humidity levels, as they transpire water through their leaves. They absorb warmth, sound and filter the air of harmful gasses and dust. Research shows that plants improve creativity and reduce stress levels. 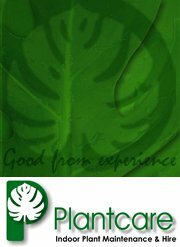 In short, plants enhance our mood and improve our general performance.